Trying to get the attention of your kids today can be a challenge. In our ever-changing age of technology it seems that screens get smaller and more mobile while attention spans get shorter. However, if you put your mind to it, you can encourage your kids to spend time outdoors. All it takes are a few enticing fixtures. Oh, and one of these will have huge benefits for you. Let’s take a look at a few of these and see how to create the synthetic grass outdoor play space your kids will find irresistible! So this idea is pretty clever. Why not take a section of your fence and turn it into a chalkboard wall? Paint a section of fence with chalkboard paint and turn your kids imagination free. The best part? To clean it they get to use the water hose! Of course, they will likely end up wet, but that is a small price to pay for getting them out from under the vice of technology. Plus, they will have a blast. Just be careful or you might get soaked too! 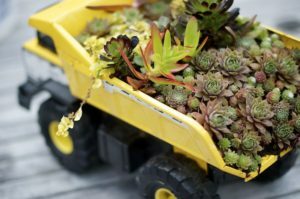 Container gardens are a great fun idea. Take your child to a garden center and pick out a few varieties of vegetables or flowers they like. Then arrange the containers on your back porch or along the fence. You and your child can tend to the plants and watch them grow. Your child will especially love picking the fruits or vegetables as they ripen. How much fun! For this there are two options. You can pony up some cash and purchase one from a local big box store. For just a few hundred dollars you can incorporate a slide, some swings and a fort style structure. The other option is to build one. There are many plans available online and doing it with your child could spur creativity in other areas. Of course, dad or mom should make all of the necessary raw material adjustments with power tools. The kids can help screw or tie pieces together as need be. A good playground fort could become the focal point of your backyard in no time. There are many benefits to using synthetic grass as a foundation for your outdoor kids play space. We will go over them shortly. However, keep in mind that synthetic grass is an attractive option for ground cover because it is evergreen. This means you always have a bright play space for your child, no matter the weather or season! 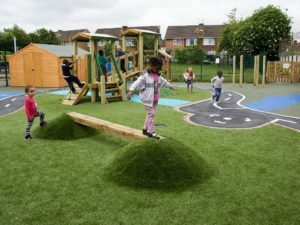 So let’s go over a few reasons why an synthetic grass outdoor play space is such an amazing idea. If you think long and hard, you can no doubt add several other reasons to the list, (like increased property value). However, following are the king of the pile! This should be the only reason you need if you’re concerned about your child’s health and safety. Synthetic grass requires no harmful pesticides or fertilizers to keep its lush green appearance. The pesticides are not needed because synthetic grass does not contain a suitable environment for hosting bugs. Hence, they move on to other places. And while they still may be present in trees or your container garden, their population will effectively be reduced to zero in your lawn. Even better, you can rest comfortably at night knowing your water sources are pure. Remember, all of these harmful chemicals have to end up somewhere. That somewhere is your local water source. By switching to synthetic grass you are doing your part to make an impact on the environment in a positive way. While this may not seem like a big concern, consider the fact that brown, dead grass eventually gets tracked inside your house. The same can be said with dirt, until it rains. Then those bare spots turn to mud (which is usually irresistible to small children). With synthetic grass, however, none of these are a problem. Instead, you get a nice, lush, evergreen lawn your kids can enjoy year round. Even better? The housekeeper gets a break. This is especially relevant if you are that housekeeper! 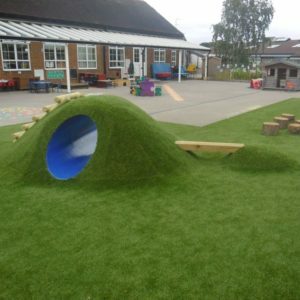 Ive Gardens Children’s Centre in the UK utilizes synthetic grass as an integral part of their children’s play space. Synthetic grass lends flexibility to your landscape ideas. Do a quick search of the Internet and you will see many creative outdoor living spaces people have designed with synthetic grass as a base element. You can find mountains, with tunnels for children to crawl through, or hills with steps and bridges to create a mini obstacle course. If you can grade it, slope it or pile it high, you can cover it with synthetic grass. Yet, these creative outdoor play spaces are just the tip of the iceberg. Why not cover one of your exterior walls with synthetic grass or a portion of your fence? Then, install tactile games if you have preschool age children. Things that spin, turn, twist, click and slide mounted on an exterior wall or fence section turn the wall into into a preschool wonderland! You will have one amazing outdoor play area! Want an Amazing Outdoor Play Space? Try NewGrass! So an synthetic grass outdoor play space has huge benefits for kids. However, you need to make sure the products can take a beating. When kids play it’s not like they are just taking a walk through the park. No, there are hundreds of footsteps pounding the surface of your synthetic grass every hour. And that’s just from one child. Multiply it for each additional child present. Hence, you need a product that can take a beating. Compromise quality or durability and you leave yourself open for shedding, seam repair or possible tearing. To prevent this, call NewGrass. We have one of the industry’s most advanced product lines and can help you make a choice that both suits your taste in budget. Plus, if you need help with design we can help you with that too. Our installation sister company, Artificial Grass Pros, has some of the best installers in the industry. They can help you navigate tricky spots or help with design elements you want Incorporated for your kids play space. Together, we can come up with the outdoor play area your kids have dreamed about!